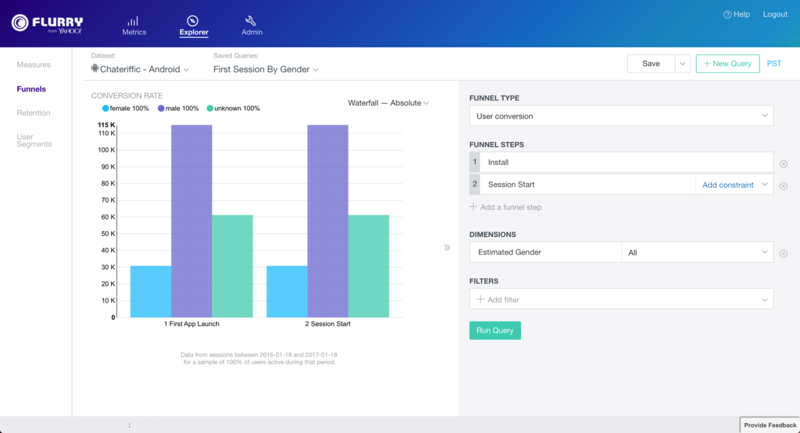 Flurry Analytics facilitates conversion funnel analysis, which means to track the conversion of users as they progress through a series of defined steps. 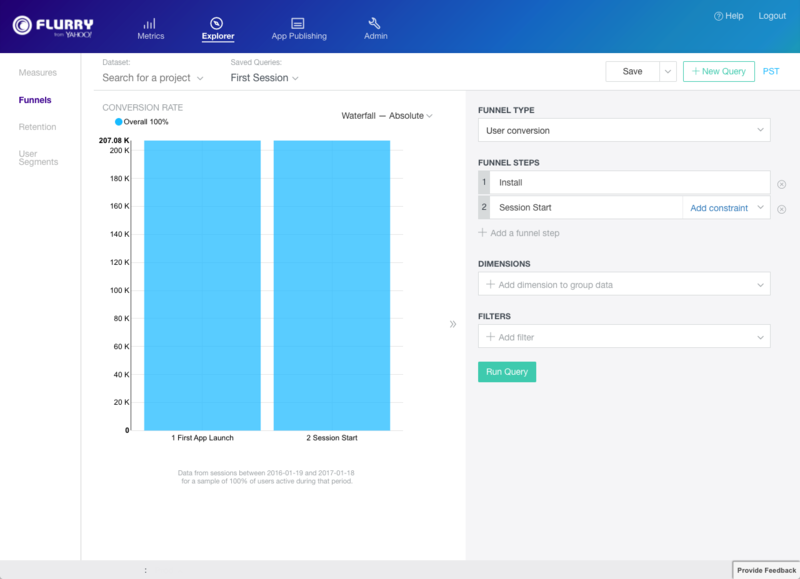 This enables you to visualize the completion rate of user progression through any event flow and identify which steps users are not converting through. Be sure to view the Explorer Funnels Video and take a guided tour of Explorer Funnels that will get you up to speed quickly. User conversion Reports unique user conversion through the funnel where a unique user will only be counted once through the funnel. When you build and run a query, this type will report on the conversion rate for your app users. Transactional Reports unique occurrences of user conversion through the funnel where a unique user can be counted multiple times through the funnel. Install: App is installed on the device. Session Start: A session is started on the device. Session End: A session is ended on the device. To build and run Funnel queries, first navigate to Explorer as described in Getting Started. Click the + New Query button. Define the Funnel Type: User conversion or Transactional. Specify the first step in the funnel by clicking the first step dropdown. 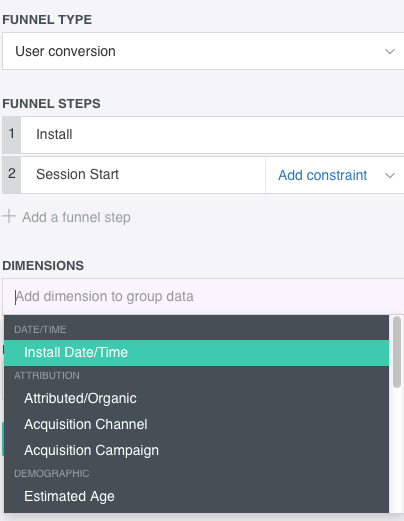 Specify the second step in the funnel by clicking the second step dropdown. Optional: Add other steps in the funnel. Optional: Select a Dimension to contrast across the funnel. Optional: Add Filters to limit the scope of the funnel. 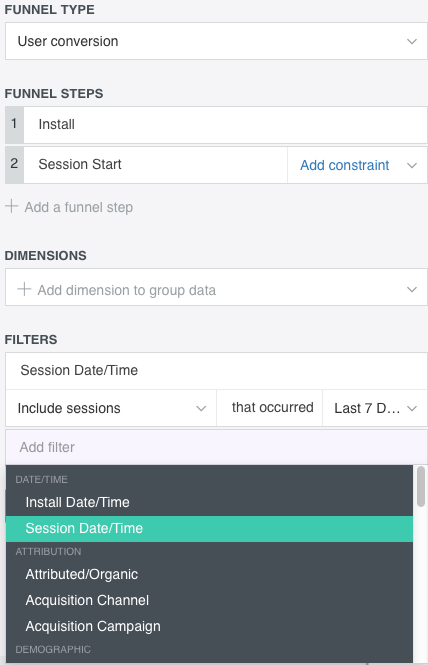 A simple funnel query where you specify the funnel type as the number of user conversions for the First Session will report the First App Launch and the Session Start, as shown in the chart below. Obviously, this funnel isn’t very interesting as it will always show a 100% conversion rate, but it shows you how the basica construction of a funnel works. and you build and run a user conversion query with Estimated Gender as your Dimension, your report will look similar to the chart shown, returning values for female, male and unknown genders of your users. To build and execute queries that return data you can slice-and-dice, Explorer lets you work with a lifecycle of Events. Typically, Explorer generates Install and Session Start events, while other events are generated by your app installs. Once you run queries on different types of events, you can easily analyze the results. Explorer enables you to determine the value represented by those events. Install. Based on an app install: for example, a unique device with your app. Install events include characteristics like install time, acquisition channel and demographic information about the device (age, gender). Session Start. Based on a unique session within an app, which starts when the app is open and ends when the app is either closed manually or has been backgrounded for a defined period of time. Add constraints. Track specific actions that users take within your app. For example, you can track making a purchase or sharing on Facebook. Custom events are tracked in your specific app’s code in Flurry Analytics. 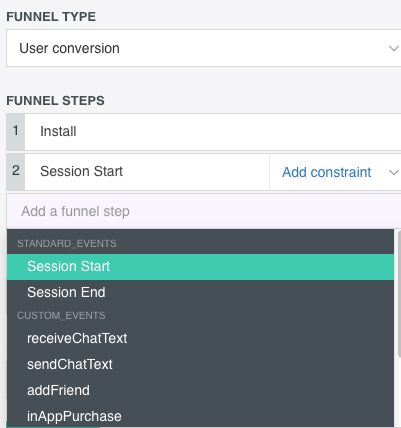 You can also add a number of Custom Events to your Funnel Steps, like receiveChatText, sendChatText, addFriend and inAppPurchase. Using Dimensions, you can define how your data is grouped and summarized. You can also add dimensions to group data. Note that if there are no data elements in the Dimensions area, the results of the query will be a single number. For the Date/Time dimension, you use Install Date/Time. A number of other Attributes can be added to Dimensions, like Attributed/Organic, Acquisition Channel, Acquisition Campaign. In Demographics, you can specify, for example, Estimated Age / Gender. You use Estimated Age / Gender to see how your users break down along the lines of age and gender. When you use Filters, the scope of the query can be limited by adding data elements into the Filter box and setting the desired limits.